In this part of the tutorial we will create an iOS app the interacts with the Vapor server that we created in the first part. The app will allow a user to log in or create a new user by just entering a username without authentication. We will create a chat app where users can create rooms and join all public rooms. We will also register for push notifications so that our users can be informed of when they have received a message when they are not online. 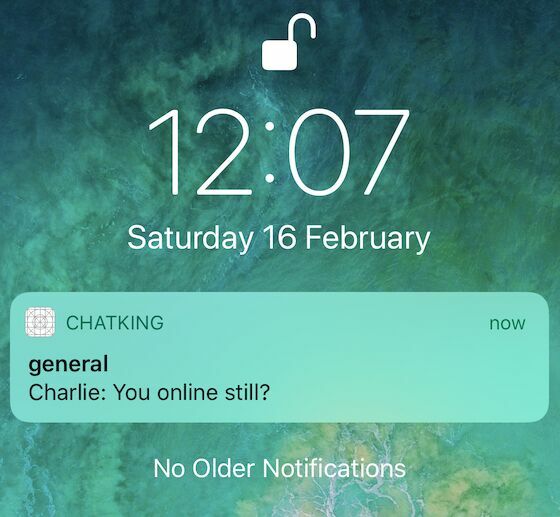 An iOS device for testing notifications. Cocoapods - Install instructions here. Open Xcode and create a new Single View App and call it “ChatKing”. We need to add our dependencies and to do this we will be using Cocoapods. Close Xcode and open the terminal and change directory to our new project and enter the following command. Now open the newly created Xcode workspace. In the project inspector select Capabilities tab and enable push notifications. We will be using a very simple UI for this application. As there is no password authentication we only need one field where a user can login or create a user from. After logging in our next view controller will show all our rooms. This will only show one room for our application. You could extend this view controller to also add new rooms from here. Our final view controller will be the chat room for our users. Setup your Main.storyboard to look like the above image. The LoginViewController has a segue to the RoomsTableViewController with the identifier “toRooms”. The RoomsTableViewController has a segue to the RoomViewController with the identifier “toChatRoom”. Create a new swift file called APIManager.swift. We will use this file in order to manage our communication with our Vapor API. static let createUserURL = URL.init(string: "\(baseURL)/api/users/new")! static let loginURL = URL.init(string: "\(baseURL)/api/users/login")! static let chatkitInstance = "YOUR_CHATKIT_INSTANCE_ID"
let url = URL.init(string: "\(baseURL)/api/rooms/new/user/\(userId)")! A User object that conforms to the codable protocol. We can use this to decode and encode a user object whilst communicating the API. A Room object that conforms to the codable protocol. We can use this to decode and encode a room object whilst communicating the API. A group of constants that we can use throughout app. Make sure your base URL is the ngrok HTTPS URL from the first part of this tutorial. You will also need to make sure that your Chatkit instance ID is correct. This makes a request to our Vapor server to create a new user. If a user with this username already exists the server will return an error. We display this error to the user. Otherwise there is a completion block returning a new user. This function is similar to the previous one. However it simply just makes a call to our login endpoint. As we don’t have password authentication in this app if the username is found then this endpoint will simply return a user object that we decode and return in a completion block. We use this function to call our endpoint that will create a new Room if the name of the room is unique. Create a new Swift file called LoginViewControllerand add the following code to it. Return to your Storyboard and assign the class LoginViewController to the ViewController as shown in the above image. You can then use the assistant editor to hook up the outlet and actions for the text field and three buttons. There are two primary functions within the login view controller. Both functions require the username from the text field and encode it as a parameter. The createNewUser function will use our APIManager to create a new user with the name provided if one doesn’t exist already. If this fails it will show an error. The signInUser function will call our APIManager and attempt to find a user with that name. Both functions will attempt to unwrap the User type that the API functions will return if there wasn’t an error. We will need the users ID to interact with the ChatKit SDK, if we have this we can perform our segue to head to our rooms controller. textField.placeholder = "Enter Room Name"
Quite a lot is happening in this class so let’s break it down a bit. Here we define our variables for class. Importantly the user ID of our user we got from our login call in the login view controller. In viewDidLoad we initialize our Chatkit manager using our user ID, token provider and chatkit instance ID. Finally at the end we call our function that will load the list of rooms for our user. This is called when a user pulls to refresh. We call our function that will reload the users rooms. We connect to the Chatkit instance which returns us a PCCurrentUser, where most of our actions will take place. Once we have connected to Chatkit we see if the user is in any rooms and assign them to our rooms variable. We then see if there are any other rooms our user can join by calling getJoinableRooms. Notice how we also call self.currentUser?.enablePushNotifications() here. This will enable push notifications for the current user in Chatkit. This function will ask Chatkit for all the rooms that the user can join. We will then iterate through this array and add the user to each room. This action is called when the user presses the + in the navigation bar. If you haven’t already make sure this outlet is hooked up to your storyboard. We create a UIAlertController and associated actions asking for a name for new room. On the save action we call our function to our APIManager to create a new room with the new name. Notice how on the completion block of this API call we add a slight delay before we attempt to reload the rooms. This just helps to ensure the room has definitely been given enough time to be created in Chatkit. Now that we have our Chatkit and rooms creation logic setup we need to display this to users. Add the following code to your RoomsTableViewController. When the user selects a row we will pass that room to our RoomViewController.swift. @IBOutlet weak var roomNameLabel: UILabel! Open your Main.storyboard, and assign your TableViewController to your new RoomsTableViewController through the inspector. Select the cell on the table view and assign the custom class RoomCell and connect your outlet. You also need to give your cell the unique identifier “RoomCell”. Our variables for this class, including the room we pass from our previous view controller and an array of messages. We reinitialize our chat manager, although it is worth noting we could also pass this between view controllers. However more importantly we subscribe the user to the room so that they may receive updates, e.g messages. A delegate method on PCRoomDelegate for when we receive a message. We create a new Message object and then append it to our array of messages. We then reload our messages collection view. The important sections here are at the bottom where we are checking the number of messages and also who the messages are from by comparing the current user’s ID against the that of the sender of the message. Remember to set the RoomViewController custom class in your storyboard. Finally you will notice that we have build errors. We need to create a new struct like below. You can do this in a new file called Message.swift. Here we are asking Chatkit to register for notifications on application launch and registering the device token with Chatkit once we receive it. That’s it now you can launch your application on a real device and receive updates to chats. We’ve created an iOS app that talks to a Vapor backend in order to create Users and Rooms using Pusher’s Chatkit. Additionally we’ve learnt how we can easily integrate Pusher Beams into this in order to send notifications to users who aren’t online in order to stay up to date with the chat room.